I've had "Ten Minute Thai Style Turkey" by Kate at Savour Fare saved on my Foodie To-Do List for quite a while. We finally decided to make it last week since we happened to come into a freezer full of ground turkey recently (thanks, Costco). I love Thai food and Thai flavors. If there were no consequences, I would have Thai food for every meal of every day. I really can't get enough. I'm always on the hunt for specifically simple meals that use Thai flavors, because Thai cooking can often involve lots of time, ingredients, and skills that I don't have. Yet. I just signed up for a Thai cooking class next month! I haven't taken a cooking class since my 10th birthday party (Yep, I have the best mom ever and she threw me the most creative themed birthday parties. Hi mom! ), so I'm pretty excited. 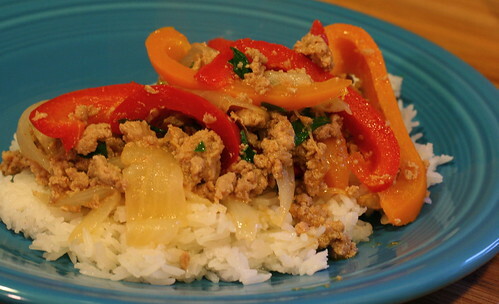 I've been looking forward to making this because it's quick, Thai-inspired, and healthy. It's also very adaptable. As Kate recommends, feel free to play around the the ingredients and flavors until you get it right. The only thing I have to say about the end result: YUM. Thanks Kate! I also have to give massive credit to my awesome husband for making this dish. It's such a treat when he cooks for me. Slice the onion and pepper into slices or strips. Sauté in olive oil over medium heat until softened. Crumble in the turkey, and brown the meat. When the meat has browned, add the fish sauce, sriracha, sugar and lime juice, and cook until the turkey is cooked through. Add basil and serve over rice. This looks so good! I'm a big fan of Thai food, especially anything with basil, so I will definitely be adding this to my bookmarks to try soon!